The eldest of four children, James Scott always knew he was destined to become an actor. He was first introduced to the theater upon moving to Edinburgh, Scotland, where he got a summer job at the Gilded Balloon Theatre, working with such great actors/comedians as Stephen Fry, Ben Elton and Eddie Izzard. Quickly taken with “the business,” Scott realized that he needed to move to London to focus on acting as a career. Upon relocating, Scott was discovered and signed by the Storm modeling agency. His new gig afforded him the funds to put himself through school. Scott eventually enrolled at the London Academy of Music and Dramatic Art. After studying for two years, he moved to the States, where he was introduced to acting coach Ivana Chubbuck. Scott credits her influence and support with playing a large role in his future success. Scott first came to the attention of American television fans when he was cast as Ethan on ALL MY CHILDREN. Upon his character being killed off the soap, he received a call from the DAYS OF OUR LIVES casting office inquiring if he’d be interested in tackling the new role of EJ Wells. Scott promptly moved to Los Angeles and accepted the job. The single actor is engaged to model/actress Meyghan Hill. Began his career working in the music industry, promoting clubs and working as a disc jockey in Edinburgh, Newcastle, York and London. Modeled with the Storm agency, which has also represented superstars Kate Moss and Elle McPherson. Is credited as the camel from the Dasani water advertisements. Is a co-founder of Urth Solution, a company that helps developing markets to capitalize on their natural resources in an environmentally friendly way. In his spare time, the outdoors lover enjoys kayaking and going to the beach. DAYS Weddings That Didn't Make It All The Way To "I Do"
Nujeen Mustafa, the Syrian teenager who garnered headlines after she was featured in an ABC news report — which sparked an on-air reunion between DAYS’s Alison Sweeney and James Scott (ex-Sami and EJ) on LAST WEEK TONIGHT WITH JOHN OLIVER Sunday night — posted a video on YouTube after talking to the actors on the phone. DAYS stars Alison Sweeney (Sami) and James Scott (ex-EJ) were reunited on screen last night on the HBO show LAST WEEK TONIGHT WITH JOHN OLIVER. A teaser has been released for Roxanna’s newest video, “Here With Me”, which features DAYS alum James Scott (ex-EJ). The clip can be seen here. James Scott, who just wrapped his stint as DAYS’s EJ, will appear in a music video with Roxanna for her second single, “Here With Me”, a prequel to their previous collaboration in "Unforgotten." In the new issue of Digest, on sale now, James Scott (EJ) breaks his silence about his exit from DAYS, what his last days were like, how he feels about his loyal fan following, whether or not he'd do another soap and so much more. 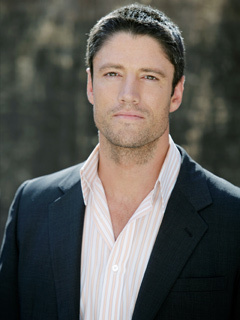 After eight years in Salem, James Scott wraps up his run as EJ DiMera today, May 2, though with the show's production schedule, he will air well into the fall. Salem faves Alison Sweeney (Sami) and James Scott (EJ) will appear with Jay Leno tonight on THE TONIGHT SHOW WITH JAY LENO — which seems to be a soap opera of its own of late.